When was the last time you stopped to consider how much your photographic equipment was worth? Or what might happen should it get accidentally broken or even stolen? If you’ve compiled a good collection of cameras, lenses and other photographic equipment over the years then it’s almost certainly time to consider some form of insurance. Most compact cameras can, of course, be replaced quite cheaply, however if you own a DSLR or a compact system camera along with a selection of lenses then we’re sure that you can appreciate the importance of protecting the investment you’ve made in your equipment should anything untoward happen to it. Aside from looking after your equipment, locking it up when not being used and using some basic common sense to keep it in good working order and ensure thieves and oppurtunists aren’t able to swipe it, insuring your equipment is by far the most practical solution. In addition to regular home contents insurance deals that may (or may not) cover your gear, there are also a number of insurance firms that offer packages specifically designed to cater for expensive-to-replace electronic devices and photographic equipment, and the competition between them means you should be able to secure a better deal if you hunt around. That said, it’s vital that you understand precisely the level of protection you have should you need to make a claim. The following guide to camera insurance examines what’s available to the photographer and what you need to look out for when assessing the different options. In terms of faulty equipment, this is your first line of defence. 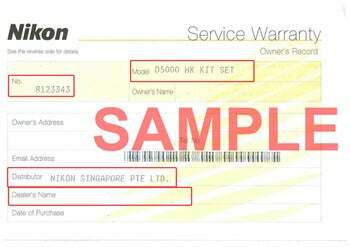 All new cameras and lenses, and some second-hand and refurbished models, are covered by a manufacturer’s warranty. This typically lasts for a year from the date of purchase, and covers any problems for which the manufacturer is clearly responsible. A camera that refuses to turn on, for example, or in some way doesn’t work as it should is covered, however any damage that you’ve caused yourself through negligence or misuse is not. It may be possible to purchase an additional warranty when buying a new piece of equipment, and these sometimes stretch to accidental damage. Although these incur an additional expense, these are attractive as they allow for peace of mind when most things go wrong. As regards having your equipment stolen from your house, its certainly worth checking whether your photographic equipment is already covered by your home contents policy. Depending on the specifics of your chosen policy, you may be covered for accidental damage, loss and/or theft, and you may even have some degree of protection abroad if you temporarily take you items with you, such as for a holiday or business trip. 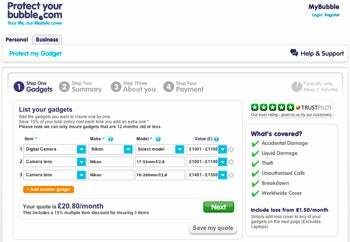 Be sure to check in advance as there’s clearly no point in insuring the same item twice. And if your home contents policy requires you to name individual items over a certain price, be sure to keep the policy up-to-date with all your latest purchases once in a while. If going abroad on holiday (as opposed to paid work abroad) you may find your travel insurance already provides some degree of cover for your photographic equipment. Just be sure to check exactly what’s covered before packing your most expensive cameras and lenses. In recent years there has been a marked rise in insurance companies that cater specifically for gadgets and electronic devices. 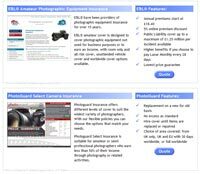 These include online sites such as ProtectMyBubble.com and Gadgetbuddy.com While these sites are generally quite simple to use, we found that their prices tend to be a bit higher than regular insurance firms offering tailor-made photography packages. We tried getting some quotes from the two aforementioned brokers for a Nikon D7100 with a 17-55mm f/2.8 lens and a Nikon 70-200mm f/2.8 lens with a total insured value of £3500 and received quotes of between around £17 and £20 per month depending on whether we wanted overseas cover or not. If you want to take out a camera-specific insurance policy then you’ll generally find that brokers offer two types of policy: a standard level of cover for enthusiasts who’ve built up a valuable collection of cameras and equipment but shoot for fun, and one that’s primarily designed for working professionals who use their equipment to make money with. Ultimately both will insure your equipment against theft or damage, although as you might expect the maximum insured value will generally be higher for those taking out professional-grade insurance policies. Both standard and professional policies will also usually offer some form of Public Liability cover, which insures you against any damage to persons or property as a result of your own negligence. Policies tailored for working professionals often extend this to cover assistants as well as yourself. One major difference between standard and professional policies is that professional packages will usually include a Professional Indemnity element to cover you against costs arising out of any legal disputes between you and a client – for example, the loss or destruction of a memory card containing all the images you’ve been contracted to shoot before you’ve had a chance to back them up. If you’re a jobbing pro then there really is only one way to go, and that’s a professional package – it’ll cost you more obviously, but then it could could cost you even more if you’re not covered and things somehow go catastrophically wrong on a job. When seearching for a quote online you can expect to face a number of addtional questions on top of the basic question of how much your equipment is worth, including but certainly not limited to things like whether you want in-vehicle cover to guard against thefts from your vehicle, whether you want EU-wide or overseas cover (often limited to 30 days a year or therabouts). You may also be asked if you want to take on a voluntary excess charge to reduce yor overal quote. Be aware that your final quote will vary considerably depending on your answers to such questions. 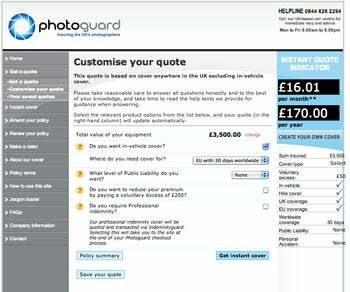 For example, using the same Nikon D7100 package mentioned above we found that one online broker (photoguard.com) provided us with an online quote of just £7.35 a month for basic UK-only cover with no in-vehicle cover and a voluuntary excess of £250. However by adding EU-cover (including 30 days worldwide), in-vehicle cover and waiving the voluntary excess the same quote shot up to £16.01 a month – quite a difference we think you’ll agree, albeit still marginally cheaper than any of the gadget insurance companies we tried. One of the first things a photographer will want to know when taking out camera equipment insurance is what position they’ll be in if things go wrong. If your equipment is unusable for whatever reason, you may be able to hire equipment out until yours is repaired or replaced. Companies sometimes state how long you should expect to wait for a replacement (for example, 48 hours). If your camera equipment is beyond repair, what you can claim for depends on your policy. It it states that you will receive a ‘new-for-old’ replacement, then the value of your goods will be met by an equivalent replacement. 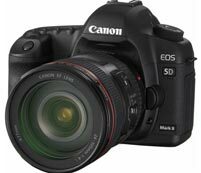 If your camera is no longer a current model, you should receive a new one that is of an equivalent specification. The other type of policy is known as indemnity policy, or ‘wear-and-tear’. This takes into account both wear and tear and the depreciation in value of goods throughout the course of their lifetime, and so what you receive will not cover an equivalent model in a brand new condition. Although this isn’t quite as good, the premium for this cover is lower than it is with the first type. article to help you get started, however there are many more. also be entitled to a discount for booking online. company is prepared to match it. If you work in or hire out a studio then you’ll need to take out an insurance policy against your equipment being broken by clients as well as any injuries that might be sustained on your premises. There are a number of brokers that offer specialist policies to cover this. Likewise you will also find brokers that will insure photo libraries against loss or damage.